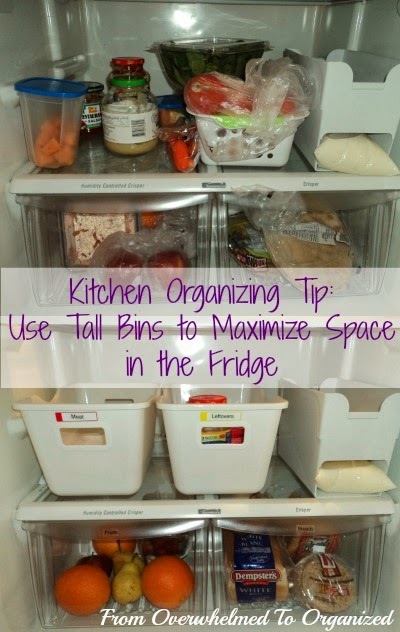 Last week I shared tips to help you organize your freezer. 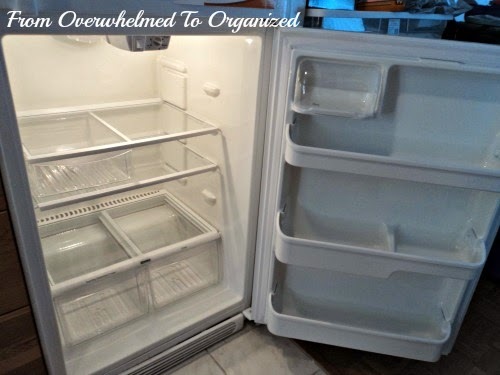 Hopefully they helped you get your freezer looking spiffy and super organized! Today, I'm moving on to the refrigerator. Fridges take a beating don't they? Food is being taken out and put back in over and over every single day by different family members. 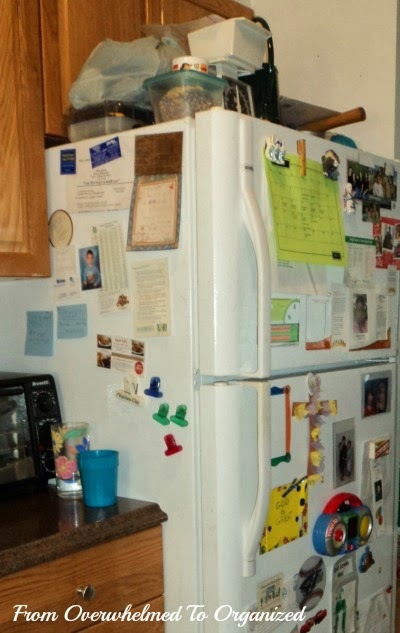 It's no wonder fridges get messy and unorganized! And then you can't remember what you have, so you buy more salad dressing and then find out you already have 3 open bottles of the same one. Or leftover food gets shoved to the back and forgotten about... until your nose reminds you one day that a science experiment is growing in there. It doesn't have to be this way though! With a little organization, you'll be able to easily find what you're looking for and family members will know where to put things back. That will help keep your fridge organized, which will save you time and money. Gotta love that! 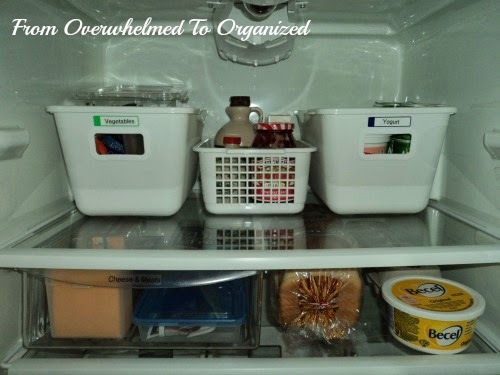 Just like with the freezer organizing tips, you'll be able to apply these refrigerator organizing tips whether you have a side-by-side fridge, a bottom-loading fridge, or a top-loading fridge. I've got bottom-loading fridge, so these pictures will show that, but the principles are transferable. First, as a refresher, or in case you missed any, here's a list of all the tips I've shared already (with links to the corresponding post). And the list continues to grow! Once again, you'll see some of these tips in my pictures today, because they apply in so many different contexts. How many can you spot in action? It was organized at one point. You can see the baskets I used to contain like items. It helped keep the shelves cleaner, but it still looked messy after awhile. Here are a couple close-up pictures. Some food was in front of the baskets and some was behind them. And some food was overflowing from the baskets. Nothing was labelled either, so sometimes things ended up in strange places. 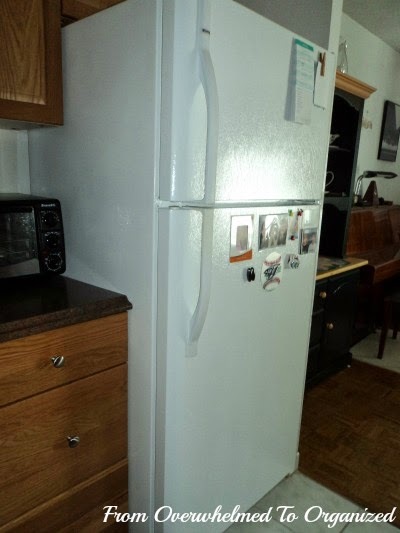 Here's a look at the fridge door. It's not terrible, but could use a quick tidy, a bit of reorganizing, and definitely a cleaning! I liked having foods grouped by categories in my fridge, but the bins I chose before were not very deep so items overflowed quite often. And they were not very long so I couldn't store as many items in them as I wanted to. 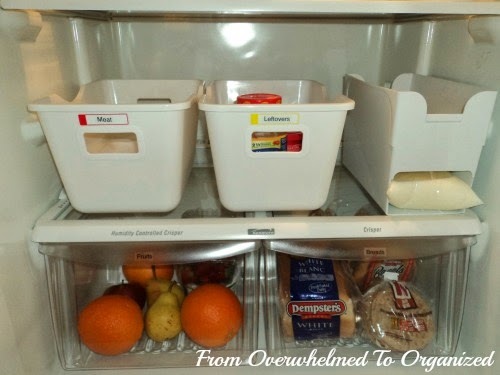 I've seen other organizing bloggers organize their fridges using these multi-purpose bins from The Container Store. 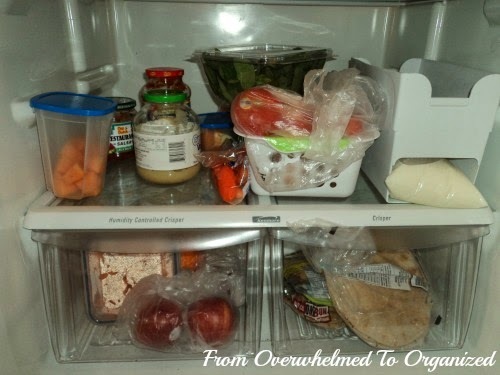 They really work great in a fridge (like this one from Jen at I Heart Organizing)! I thought I could get them here in Canada at Solutions, but they don't carry them. 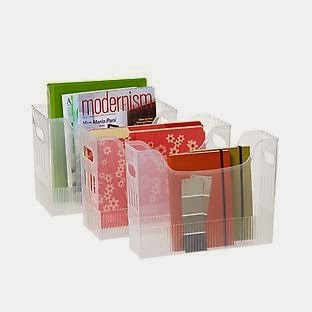 I searched all over for something similar, but all the bins I found were not as tall. So for now I went with the same bins from Dollarama as I used in my freezer. They're better than the baskets I was using. Here's how the top of my fridge looks now. I used 4 of the tall-ish bins that I used in my freezer. Unfortunately, 3 of them were too tight beside each other on the top shelf so I had to use a different basket between them. I used the same Avery self-laminating kids' labels as I did in the freezer. On the drawers I just put a the label from my label maker directly on the drawer. Because the bins are taller, I can contain all the vegetables in one bin without it overflowing or having to keep some beside the bin. Same for the yogurt. And when we have yogurt tubes they can stand up tall in the bin beside the other tubs. And do you see the loaf of bread on the second shelf? After some comments on my Tips for Decluttering Kitchen Counters post, I decided to get rid of our bread box and keep our breads in the fridge. We had a drawer in the fridge already with breads, buns, bagels, etc. that were not as fresh anymore, to prolong their life a bit more. I decided to just put all our bread in the fridge since we don't eat a lot of it right out of the bag anyway (we often toast it or we make sandwiches in the morning for lunch so it's not cold by then anyway). I relocated some baking ingredients and chocolate wafers that really didn't need to be in the fridge anyway, to clear out some space on the shortest shelf. Now I can keep a full loaf there, and the rest of our breads fit in the bottom drawer. I love the extra space on our counters now by not having that bread box on it!! I didn't have a bin for raw meat before, but we often have a few packages of raw ground turkey, pork chops, chicken breasts, etc. I used to just put them wherever there was a spot. By having a designated basket or container for raw meat, you contain any leaking from the packages. It's easier to clean and disinfect a container than the whole shelf of the fridge. If you don't want to use a container, at least store your raw meats as close to the bottom of your fridge as possible. That way, if there's any leaking, it will not drip down onto other foods below. Here's the bottom part of the fridge now. There's my meat bin and I also added a bin for leftovers. I used to just store these anywhere there was space, but sometimes they would become hidden and forgotten about. Now they have their own spot and I can keep track of them better and use foods up before they go bad. Do you see that plastic container on the right? I bought it at Solutions several years ago and I LOVE it! I know it the U.S. you have jugs for milk, but here in Canada we have bags of milk and I hated how much space they took up laying down in the fridge. 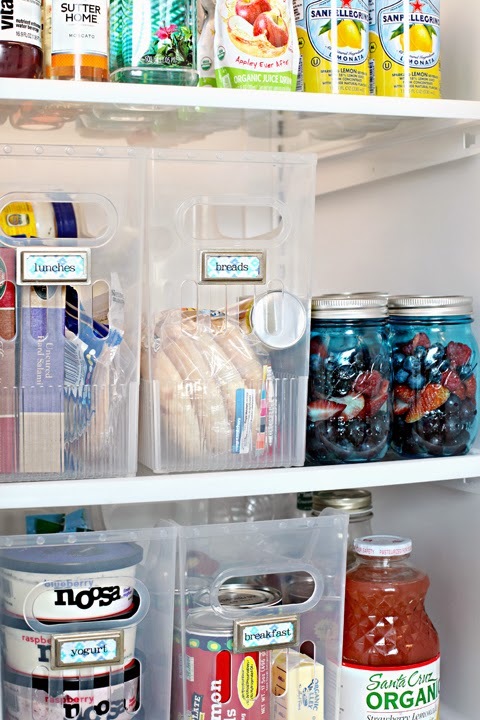 This container stacks them vertically which makes much better use of the space in the fridge! If you don't have a Solutions near you, I've seen them at Kitchen Stuff Plus and Home Hardware too. I also removed all our fruit from the bags they were in so we can see better what we have and eat it more often (see a trend here?!). I didn't change a lot here, but I cleaned all the shelves (boy they get dirty! ), and rearranged a few things. We basically store all our beverages and condiments in the door. Our milk and our Brita water pitcher are on the top, juice and pop bottles on the second shelf, and wine bottles, water bottles, and cans on the bottom. Short condiments are on the top left (under the dairy compartment), frequently used condiments are on the middle right, and less used condiments are on the bottom left. I played around with different arrangements to try to group all the beverages together and all the condiments together, but with the heights of the shelves it didn't work well. This was the best use of our space. 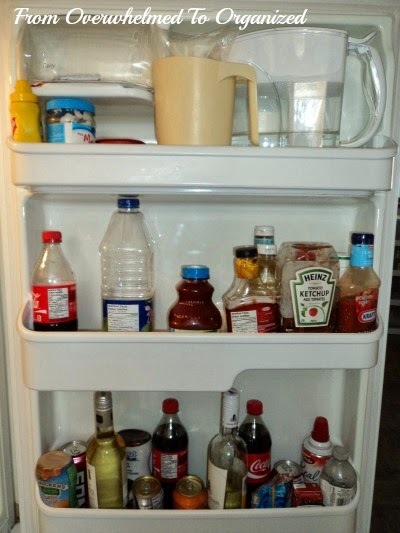 Lastly, I want to show you the outside of my fridge. It used to be a cluttered mess. This picture is from several months ago and I've slowly been taking things off the front and sides. 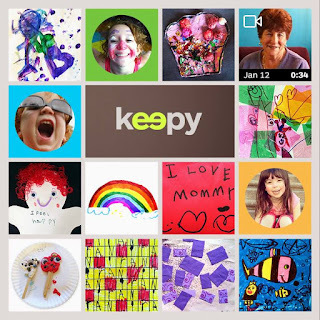 My kids, especially my daughter, LOVE having lots of magnets on the fridge and any craft they ever make that has a magnet on the back was automatically put on the fridge. I've been trying for a couple of years to put away or give away some of these crafts and magnets, but my kids always resist the idea. While my daughter was helping me decorate at Christmas she took off a whole lot of things to help make room for some Christmas magnets. There was a lot less clutter on the fridge for those 5-6 weeks and I think they started getting used to that. So I only put back some things back in January. I have a few things hidden in a bag in case they ask, but so far they haven't missed them. So when I took off a few more last month. And a few more last week. No real response. Yay! Until my daughter saw me taking pictures of the fridge for the blog and then asked why I had taken off so many magnets. Oops... note to self: take pictures when the kids are at school. I just said I thought it looked nicer with only a few of our favourites and she actually seemed OK with that. Phew. So much less cluttered! We're down to a few pictures, my menu plan pad, and a few magnets for the occasional times we want to hang something on the fridge. 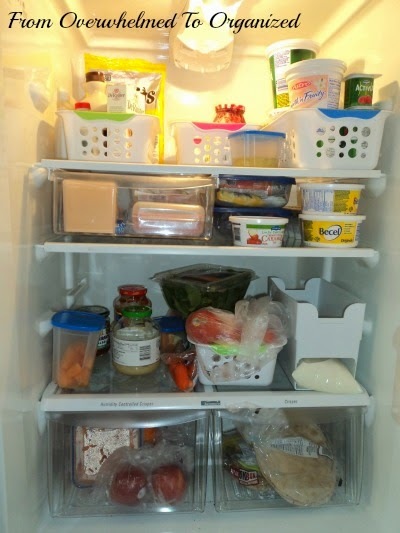 So now you can use these tips to organize your fridge! No more science experiments in the back of the fridge because they were jammed back there and forgotten about. And find (and put away) your food easily because foods are grouped and contained. 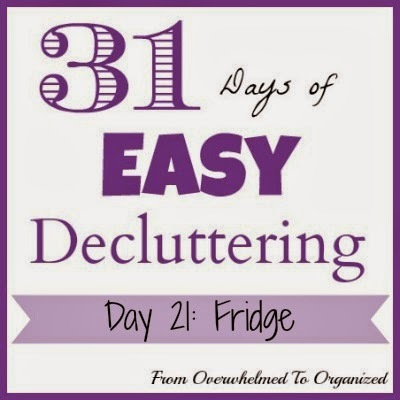 For tips on decluttering your refrigerator, check out this post from the 31 Days of Easy Decluttering series. 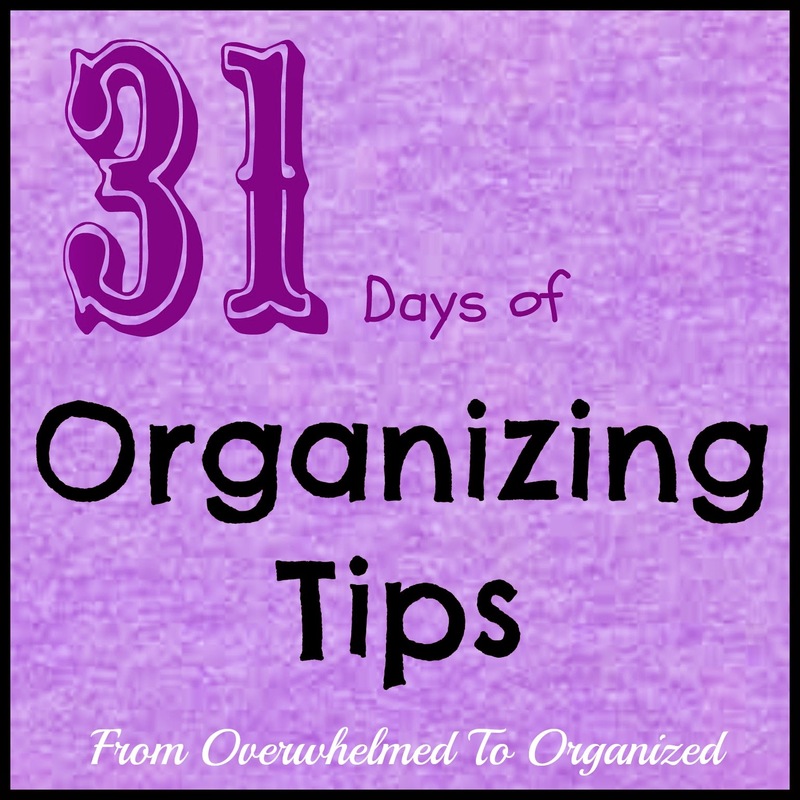 And for more fridge organizing ideas, read this post from the 31 Days of Organizing Tips series. And, you can always find more kitchen organizing ideas on my Kitchen Organizing board on Pinterest. 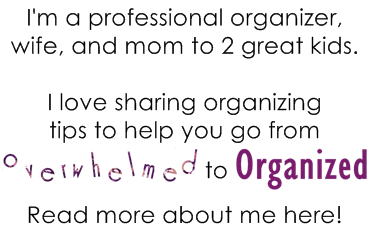 And if you want to get your home clean and organized this spring, don't forget about the All Organized eBook bundle sale going on right now! 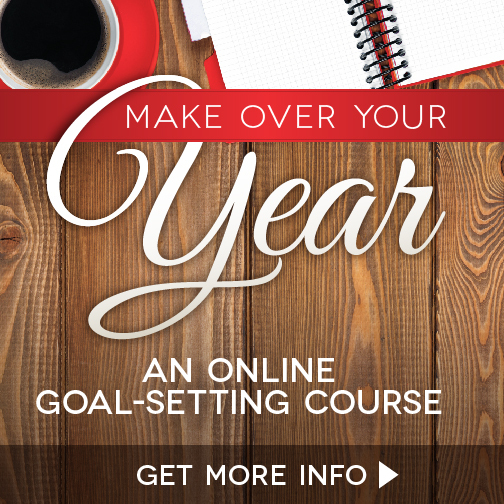 I've been reading several of these books and they are SO helpful! 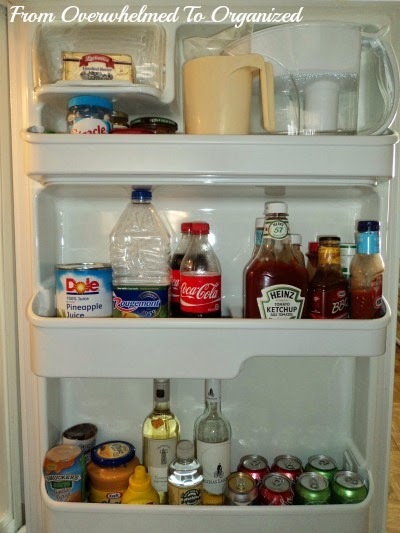 How do you organize your fridge? 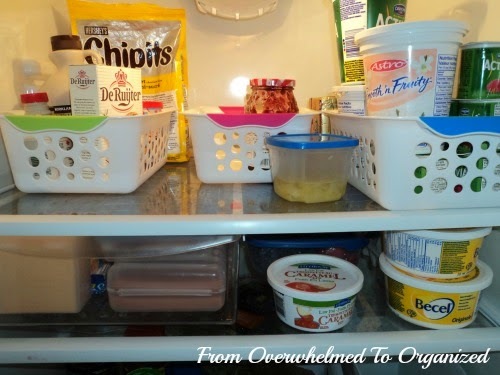 Do you have other tips for keeping your refrigerated foods organized? Wait. Milk comes in a bag in Canada? Does it have a spout? I'm pretty sure I would make a huge mess of that. What kind of labels do you use on containers of leftovers? I need something that wont break my arm getting off when its empty. I actually don't label my leftovers very often Emily because we use them up fairly quickly most of the time. I have used masking tape sometimes. But now that I've opened that package of Avery labels (the ones I used on the bins in this post) I will probably use those. They come off pretty easily. There are different shapes and sizes in the package. In our house, leftovers old and new get moved around everywhere so putting a date on them is something ive found helpful for us. I didnt think of masking tape. I have regular labels on them now and as I mentioned jn the first comment, they take forever and a decade to come off. Thanks for the suggestion! I hope the masking tape idea works for you Emily! I just remembered another idea that a friend of mine does... she uses a dry erase crayon on her lids kind of like a chalkboard and it erases off easily. 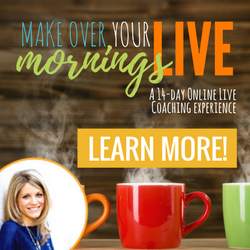 You can check it out here: http://www.organizinghomelife.com/archives/2943. 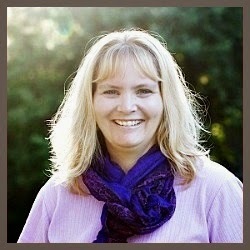 Spring is a good time to tackle these kinds of things Cathy! Hope the bins work well for you. We used to re-use the empty bags for freezing because they're quite thick bags. I don't find them messy though. This is great! I also have little containers in my fridge. I'll have get so larger containers for organizing. I hate how filthy the fridge gets on minutes after I organize it once/twice a year. I find containers really help Adrianne. Being able to wipe out a bin instead of the whole fridge makes it easier to keep it clean. Good luck! Thanks Jessica! I love how much less cluttered my kitchen feels by just getting rid of stuff on the outside of the fridge.